College sophomore Hannah Maquiling doesn’t know why everyone tells her their love problems. She’s never even had a boyfriend, but that doesn’t stop people from spilling their guts to her, and asking for advice. So maybe it shouldn’t be a surprise when the cutest guy in school tells her that she’s going to have to take on this responsibility — but for all humanity. The Goddess of Love has gone AWOL. It’s a problem, because her job is to keep in check this world’s obsession with love (and lack of it). The God of the Sun, for now an impossibly handsome senior at an exclusive college just outside of Metro Manila, thinks Hannah has what it takes to (temporarily) do the job. You know a book is good when you go back and reread some most of the book the moment you’re done. Sometimes it’s just to read your favorite parts, but for others (especially for novellas), it’s almost like reading the entire book because you just can’t get enough of it and you want to relive the events of the book. 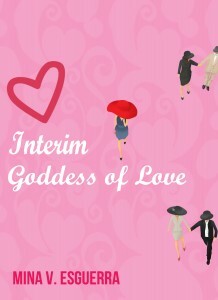 Such is Mina V. Esguerra’s newest novel (and her YA debut), Interim Goddess of Love. College sophomore Hannah Maquiling is a scholar in exclusive Ford River College, and she’s caught the eye of Joaquin Apolinario, aka Quin, one of the hottest guys in school. But it wasn’t in a way that she (or anyone else) expected. She caught Quin’s eye because Quin is also the Sun God, and he needs her to be the Interim Goddess of Love. The real Goddess of Love has gone missing, and someone needs to fill in her shoes for a while, and Hannah fits the bill. Hannah accepts (because the Sun God was nice, not to mention cute), and starts using her powers on Kathy Martin, a shy classmate who’s all flustered about her secret admirer. Speaking of happy endings, there are the boys. As usual, Mina created very crushable guys to go with her heroine, not just as romantic interests. I found it funny that one of the questions that came up while reading this book was “Who’s your favorite?” That’s because there’s not one but three guys in the book, each with their own charm. I am particularly fond of Quin, but mostly because he’s the one in spotlight, but the other two guys provide good contrast (and competition) for the god of the sun. Interim Goddess of Love is another great book from Mina, and I still can’t stop grinning when I think of my favorite scenes. My only wish was it was longer because I definitely wanted more when I was done. I am so glad that this is the first book of a planned series and that the next book will be released later this year. I can’t wait to read about Hannah’s next goddess project (and more Quin moments, hihi :”> ). I hadn’t heard of this one before, but it sounds like it would qualify for my “New Adult” reading challenge! Thanks for the review, I can tell you quite enjoyed this book :) Plus, the tie-in to Phillipine mythology is neat! It’s free until tomorrow, Danya! :) Hope you enjoy it. Ahhh, I still haven’t read this one! I have failed in my role as Mina V. Esguerra fangirl. I haven’t read and reviewed it like you and Chris. :( This review amuses me though because you’re obviously kinikilig because of the book. Can’t wait to read it! I totally “purchased” this when Chachic tweeted me about it! And then this review went up, so now my expectations are pretty high! Hopefully I’ll love it and then go and read all her other books, too. I *just* started this. It’s been fun so far, and seeing your strong like of it just makes me that more excited. Also, I didn’t know it’s the start of a series? Excellent.